We sometimes steep this tea for 3 minutes and it is quite delicious – a little deeper flavor and with more body. Tea Trekker’s Yunnan Hand-Rolled Green Curls-Imperial Grade is a bud and leaf tea (a mao jian pluck) picked in early March when the weather warms in Yunnan Province. This is the highest, most premium grade of this manufacture. Because these leaf materials were picked and manufactured when they were so young, the tea is a lovely greenish-white color. The tip is prominent, as it is in its namesake tea from Jiangsu Province, although these curls are much larger in size! Modeled after the China Famous Tea Bi Lo Chun from Jiangsu Province (just northwest of Shanghai) this tea is not a copycat. The term “bi lo chun” can also be applied to leaf from other regions that is prepared into the same shape. In fact it can even be applied to other categories of tea, although this is somewhat rare. The final shape is that of a snail, as the transliteration for bi lo chun is ‘snail spring’. The mao jian pluck is often used to fabricate this manufacture because it is the perfect amount of leaf in the perfect form to enable the expert tea workers in Jiangsu Province to roll and fire the local leaf into the desired finished shape of the Famous Tea from their province. The same logic applies to this manufacture, although the leaf is much larger so the finished ‘snail’ is also much larger. It is still very difficult to roll, shape and fire this profile of tea. The tea firers who do this shaping are among the most skilled in their regions. Another aspect of this manufacture is that the heat of the pan for firing is particularly high; this sealing of the surface tension of the leaf contributes two aspects to the finished leaf. It lengthens the shelf life during which the tea retains its’bright’ taste and aroma. the hot-firing also contributes its distinctive ‘nutty’ or ‘chestnut-like’ taste. While this tea manufactured in Yunnan Province has some of this nutty taste, it does not overshadow the inherent Yunnan flavor of the leaf, but rather compliments it. Yunnan teas’ “caramel” notes are enhanced by this firing and thie Imperial Grade Hand-Rolled Green Curls shows that well. In the cup this tea is fresh and delicious – light, airy, and rich – a lovely combination of flavor and aroma that satisfies and soothes at the same time. 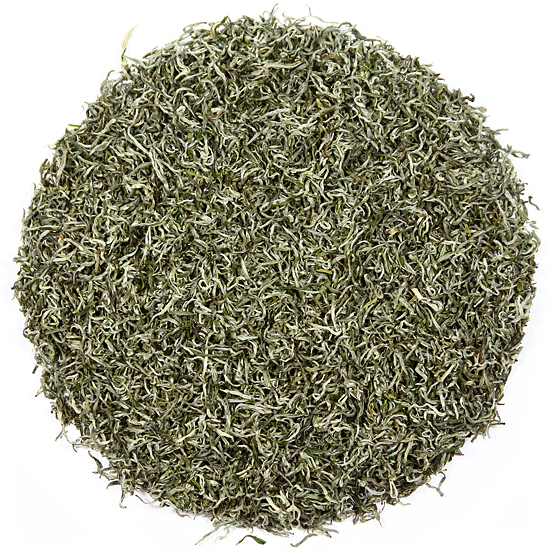 This tea is both softer and more aromatic than our ‘regular’ Hand-Rolled Green Curls. Tea Trekker’s Yunnan Hand-Rolled Green Curls-Imperial Grade has a unique core flavor that is similar to that of the Yunnan greens as a group – soft, chestnut-y, and smooth -that is a result of the special nature of the indigenous tea bushes that grow in this region. Our Imperial Grade is plucked from bushes that are a hybrid of these indigenous bushes and modern plantings in order to produce smaller, more tender leaf that will manipulate into the desired shape as easily as its cousins in Jiangsu Province do. The flavor of this tea is nuanced, sweet and subtle. Imperial Grade Green curls are smooth and full-bodied without a hint of astringency. This tea should steep successfully several times but not as many times as the regular Green Curls.